Lately, I've been really inspired to become very crafty, and I don't mean sneaky. After looking at the tutorials for knitting, I crossed that out quickly. Then, I turned to crocheting, which seemed to not be quite as difficult. 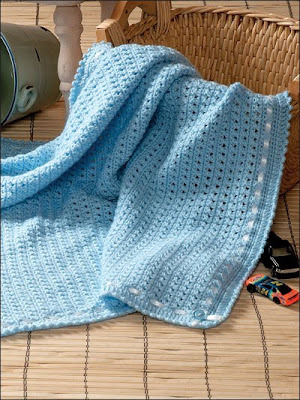 I'm attempting to make the blanket pictured above. I figured that if I could get the first three rows (they are the basis for the entire blanket) then I could complete it. So far, I have completed the entire first row of 149 stitches. I tried taking pictures of what I have completed so far, but my camera isn't cooperating.